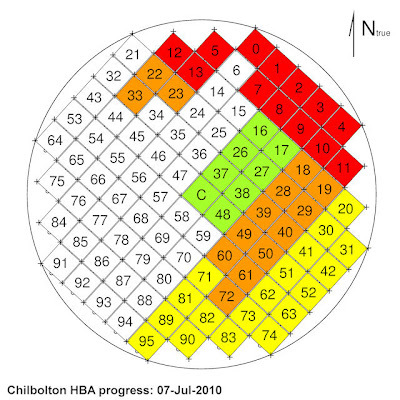 Here is the updated completion map for the LOFAR-Chilbolton HBA antenna installation. Today's progress is marked in light green. The rework on HBA tile #0 was also completed today. Also, the last tile installed today was the centre tile, which is a dummy load only, and not an actual active tile. We have done a lot of work today in consolidating palettes and clearing the site as we move across the field.